3.5 hours on a bumpy country road is rough, imagine doing it on board a rickety bus packed with Naples locals and eager foreign trekkers. As we arrived in Besisahar all the hikers happily filled off the bus. 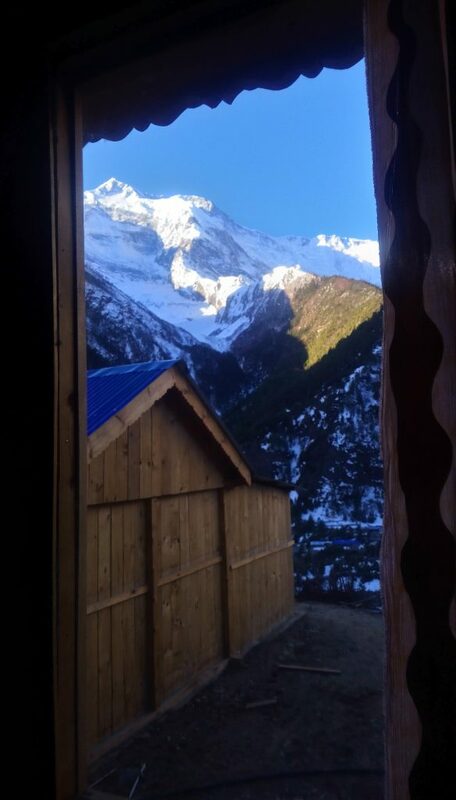 This town is the official start of the Annapurna Circuit, one of Nepal’s most traversed treks. The crowned jewel of the trek is about halfway through the 16 day ordeal, Throng La Pass. At 5,416 meters it out reaches any summit I have ever attempted. If that wasn’t enough of a challenge Nepal had a late winter this year. 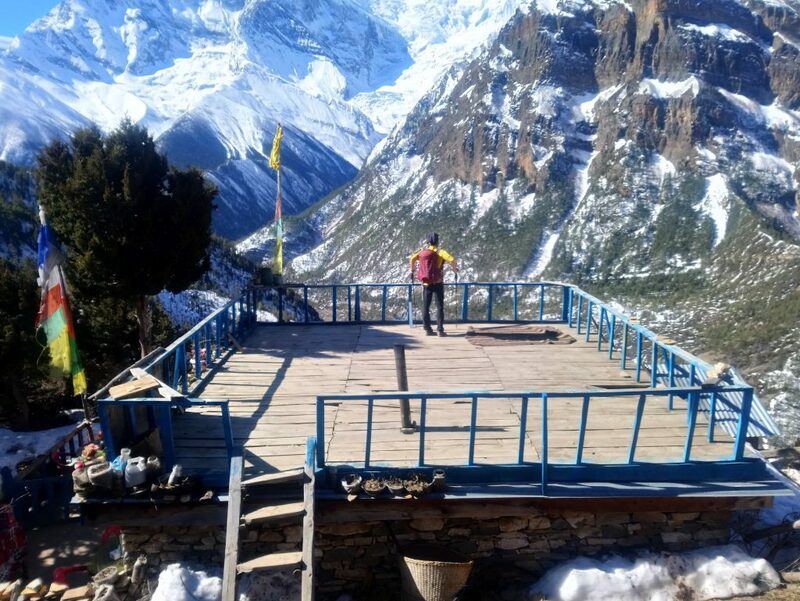 Late March is usually one of the Annapurna Circuits peak seasons however this year the pass only opened up a few days ago. Word has it that conditions up there are still very snowy. Thankfully I have 9 days of trekking before reaching the daunting pass. The sun is shining as I start my hike out of Besisahar. I picture the snowy trail ahead melting with every step I take. At noon I make it to the village of Bhulbhule. Checking the map I realize I am at 820 meters, reinforcing how far I have to go. As I put away the map a young man starts making small talk with me. Within a few minutes I surmise he runs a hostel in Ngadi, the next town over, and ‘invites’ me to stay at his place for the night. He sells me on the hostel and after a cold plunge in the Marsyangdi river and a stretch session on the river bank I decide to spend the night in Ngadi. At the Peace & Love hostel I meet Paul. He is also hiking the Annapurna Circuit and previously thru hiked the Appalachian Trail. 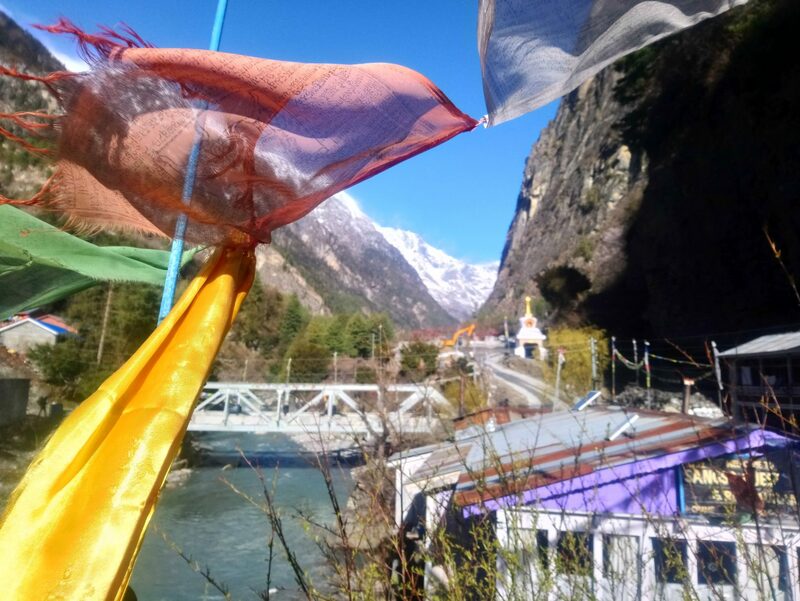 Naturally we reminisce about our trail experiences and compare the Annapurna Circuit to the AT and PCT. The biggest difference is that on this trail each night is spent in a tea house, you are never far from a warm meal and a room sheltered from the elements. Yet the common experience of spending every day hiking is a strong through line. I spend the next day passing towering waterfalls and small villages. There is one that I thought was as impressive as Yosemite Falls. Paul added, “Except is even better cause there isn’t throngs of tourists.” I agreed. I arrived in Jagat at 2:30. I found myself a room in one of the tea houses and after quickly unpacking was eagerly walking again, this time following signs for hot springs. I was not disappointed by the warm water perfectly placed near the cold river, an ideal set up for hot/cold immersion. Planning for this hike I did not realize there are hot springs en route. I found out while soaking, from an Italian guy who spent lots of time on this trail, Jagat is one of three hot springs on the Annapurna Circuit. The next is in Chame, 2 days away. The last one is in Tatopani (which means hot water in Nepalese) near the end of the hike. The memory of the warm water from last night served me well as I hiked through rain and clouds the next day. I was soaked by the time I reached Dharapani. 6 hours into my hike I was determined to keep hiking. Half an hour off the main route lies the tiny mountain town of Odar. I wanted a closer experience of Nepalese culture and this town was the perfect opportunity. For starters I was the only visitor in town that night. Instead of eating dinner with other trekkers I ate with a local family. As they made the Dahl Baht, the most popular meal out here consisting of rice, potatoes, fried greens, and a bit of pickled radish, I played ukulele for them. Aside from the bits of whistling I added, which they promptly informed me was bad luck, they enjoyed hearing my western tunes. 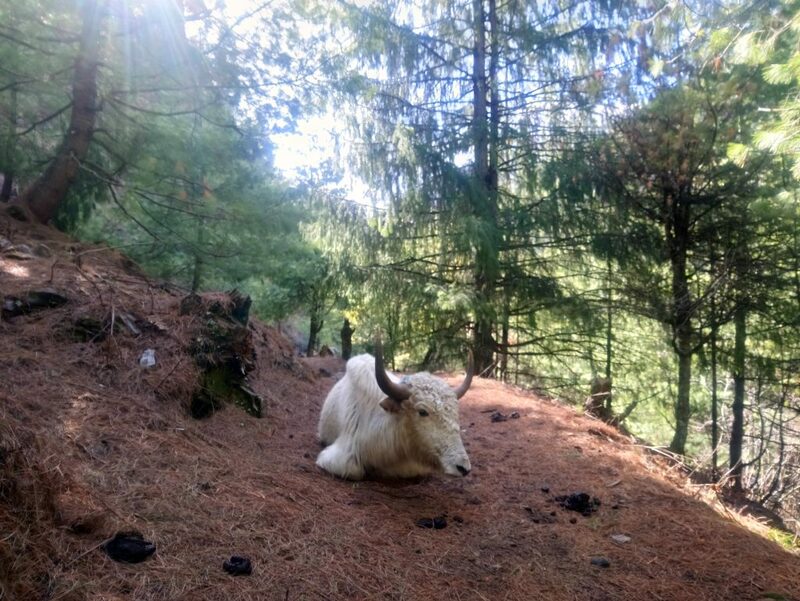 I said goodbye to my new friends the next morning and started walking towards Chame with an extra spring in my step, knowing it would only be a few hours before I was submerged in the nourishing waters of another natural hot spring. My eagerness was combated by outbursts of rain that continued from yesterday. In Thankchok I stopped for one of the most delicious meals I have had on my travels thus far: Corn bread in the Nepalese style with a pumpkin, potatoe, and bean stew. I enjoyed lunch in the company of a couple from Australia who had started their hike the day before. After a nice conversation about our fears and expectations for the days to come, and happily finishing of their leftover corn bread, I re entered the rain for another hour of trail before arriving in Chame. I rushed through the town passing shops and tea houses until arriving at the northern edge of town, finding the tea house closest to the hot springs. I once again unpacked quickly before finding myself in the hot water, this time amid the rain. That blissful state of relaxation reminded me of sitting in the hot springs at Muir Trail Ranch on the PCT/JMT during a hail storm. Everyone at the tea house spent the evening in the dining room, huddled around the furnace, sharing travel stories and future plans. The next morning I felt incredibly rejuvenated. The weather had finally cleared and the view of Lamjung Himal was astounding. In an hour I reached Bhratang, a town built around its apple orchards. I stopped for a cinnamon roll along with some dried and fresh apples, all of which where devoured promptly. All that sugar gave me the energy to charge through the days trek through a very coniferous area. The shade of the trees where a nice change from the generally open, albeit incredibly scenic, trail. I arrived at Upper Pisang at 1pm. Getting into town that early feels weird, like I should continue hiking. Instead I had an extra long stretch, meditation, and dip in the river. By the time I got back to my residence it was only 2:30. In moments like these the downsides of traveling alone become poignant. Boredom and loneliness emerged. I tried to strike a healthy balance of feeling the emotions and ‘uncomfortability’ that arise and distracting myself with podcasts and music. Eventually dinner time arrived. I ate with the Australian couple I met a few days ago. I devour two helpings of dahl baht and head to bed very satisfied, even having a bite of Kevin’s apple pie. That bit of dessert was a harbinger for all the snacking I did the next day. An hour into my hike, after some treacherous uphill, I have a short break at Mahendrapul. For 100 rupees I score my very own piece of apple pie. A few hours later, halfway into my days hike, there is a bespeckled Nepalese man selling fresh pastries. His mini bakery is seemingly in the middle of nowhere and seeing the smiles of my fellow hikers eating a chocolate pastry I endulge yet again. I have lunch in a large town at almost 4000m. 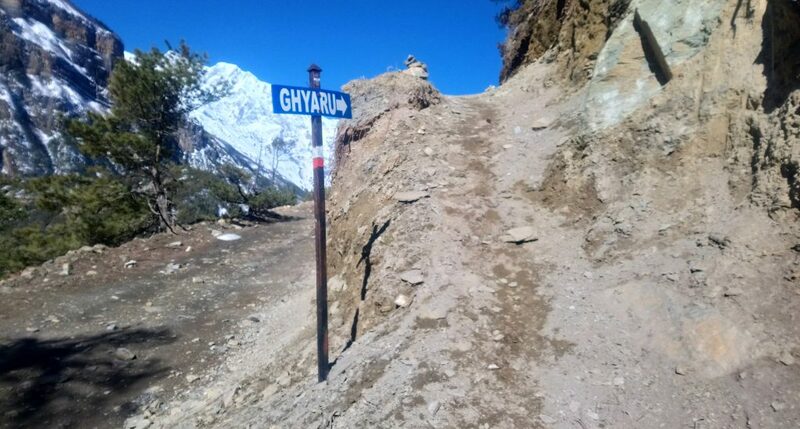 I notice a slight headache coming on after lunch, leading me to take the lower trail into Manang. The lower trail is easier and shorter, I finish my hike at around 2pm with the headache alleviated. In town I run into many people I have met during the past few days. Many hikers, myself included, take a rest day in Manang to acclimate to the extreme altitude before working their way even higher. With small movie theaters, aromatic bakeries, and gear shops it is the perfect place to relax a bit before taking on Throng La Pass.